"Can I ask you something," He shrugged. "Y....ea...h. Please go ahead," I said with a gleam of excitement glittering in my ♥♥ eyes. "Well. Why do you trek!?" "Ahh! ?," I exhaled with dismay and replied him, "Well.. To keep me fit"
"Come-on. You are already fit" That one compliment took my heels to heaven. He snapped and said, "Weekends are meant to take rest and partieeeee!!! Don't you really feel bored to wake up at 5 (sometimes even before) on a Sunday and go for a strenuous activity?" Well that question really made me to think and even understand the view of people who don’t wish to accelerate their body. Why do people do trekking? Below are my own thoughts and experiences. Trekking burns lot of calories. Someone complained, "I do trekking from past 1 month, but not a single pound lost". Well, eating lots of junk foods will neutralize your physical activity. Avoid eating Junk foods during trekking and replace it with healthy fruits. Definitely, trekking on a long run keeps you strong and fit. Observe the passionate trekker figure and fitness. "Rejuvenate Yourself! This Winters!! Pay Just Rs.2500 for a body message and pamper yourself," I can’t assure whether those beauty parlor advertisement can rejuvenate. But trekking definitely boosts you to the core and keeps you recharged for complete week. Get a chance to explore the untouched treasures of nature. You tend to google about the place and enhance a lot about the place, if-not; one of the co-trekker would tell the history behind it. Photography has become ubiquitous and photography lovers opt trek to capture the nature. Their clicks never take the excuse, “not a good one”. And of course it’s the best souvenir and always treasures us about the exciting voyage! Non-trekkers are now excited about trekking!? How, where, what to do? 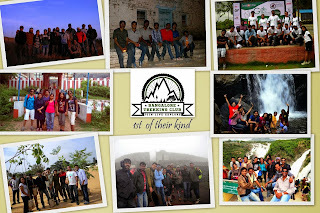 For those who live in Namma Banglore, Bangalore trekking club is a good option. When I was a first came across Bangalore trekking club (BTC), many questions popped up!? And my fellow trekkers also said they had the same questions in mind. If it safe for girls? This is the first question that got in my crazy mind. Its absolute 100% safe. "No smoking and No alcohol". Their goal is to ensure that all the trekking enthusiasts feel safe and explore the nature. They are youthful and energetic team. I am humpty dumpty. I never walked even for 1 kms in my life, Will I be able to trek? Check out the trekking difficult level. - Very easy, easy, moderate and difficult. Just give out a try by choosing Easy mode and give it a try. “The expert in anything was once a beginner.” My personal opinion, it does not matter with the difficult level, people who come for trekking are very constructive and supportive. They will help you, guide you and motivate you. All you need is “I can do it” attitude. I always had an aversion towards the people at managing level. Principal at school, Manager @ work and oh no!! Again organizers at Trekking!? BTC organizers are so friendly, down to earth and very open. Have you seen any organizer helping in removing the leeches around your legs by their hand and applying Dettol to leg? They care and do! Have you seen at least in movies any organizer carry your bags along with their bag to the hill top, in case if you are not able to!? They carry and help you! I don’t have that much money to spend for those leisure activities? It’s not an expensive one. For one day trekking, it hardly cost you Rs.250-500 and it’s not a big deal when compared visiting a mall and purchasing a dress!! Remember you are investing this for your health and nature!!! Of course they are strangers for initial 5 minutes. But the next moment, you hang out like BEST-BUDDIES-FROM-BIRTH. And yes, they do come with friends. But you will be surprised to hear that the friendship was built only in trekking. Trekking with strangers? Oh no, people may be of personality traits - rebellious, arrogant, ego-centric. People who come for trek are a bunch of candid, affectionate, flexible and enthusiastic. To till date, I never met anyone who showed an attitude, or with negative mind. The unique experience you get every time won’t be gathered anywhere. So get ready to derive happiness from trekking and you will realize that trekking has changed your everyday experience. It’s time to trek and become a slave to nature!